The Moscow City Court has declined appeals against rulings by lower courts which extend until April 24 the pretrial custody terms of four Ukrainian sailors detained following the incident in the Kerch Strait in November 2018. "The ruling by Moscow's Lefortovsky Court, which extended the custody terms for Roman Mokriak, Yevhen Semydotsky, Andriy Oprysko and Serhiy Tsybizov until April 24, has been left unchanged, and the lawyers' appeals have been turned down," the Moscow City Court told Interfax. Last week, the Moscow City Court turned down appeals against a similar ruling by the Lefortovsky District Court concerning four other sailors, Andriy Shevchenko, Bohdan Holovash, Serhiy Popov and Volodymyr Tereshchenko. The Moscow City Court is yet to consider the legitimacy of the arrest of another 16 Ukrainians detained during the Kerch Strait incident. 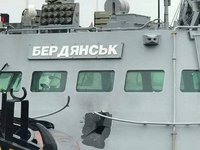 On November 25, 2018, Russian border guards used weapons to stop three Ukrainian naval vessels, the Yany Kapu tug and the Berdiansk and Nikopol armored gunboats, which were traveling from Odesa to Mariupol in the Kerch Strait. The vessels were escorted to Kerch.